Classic recipes and principles keep Eleven among the region's best restaurants. : As time passes, Eleven Contemporary Kitchen adapts to remain relevant and quality-focused. The airy, two-story dining room boasts plush banquettes, artist-designed tables, warm earth tones, good lighting and wood. 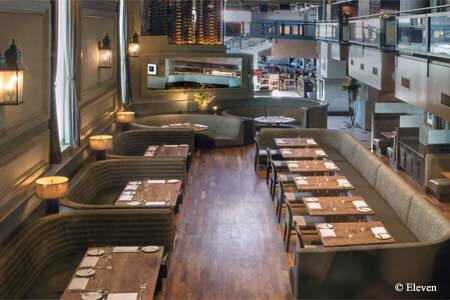 The open kitchen generates buzz, as does the inviting lounge area with its large, green-onyx-topped bar, topnotch cocktails and extensive bar menu. Upstairs are private rooms and an outside balcony with serious heaters. An elevated, glass-enclosed wine room heralds an ambitious wine program; selections are global, with first-rate options in wines by the glass. The restaurant's stated mission is to deliver "complex flavors simply prepared." The menu changes frequently, but count on a lineup of American farmstead cheeses and charcuterie, steaks and an array of well-prepared seafood. The glass-walled pastry kitchen pops out fresh bread and comfort desserts, such as spice cake and candy bar. For the ultimate experience, sign up for the Chef's Table Tasting Menu.